Happy Saturday...President Trump has started his weekend in Asia, where he will be for the next 11 days visiting Japan, South Korea, China, Vietnam and the Philippines. The expectations seem so low that perhaps anything short of triggering a trade or hot war will be considered a success? I have a couple of big announcements to make. First, this free weekly newsletter is moving to a much bigger platform. Starting November 10 the weekly version will go out in partnership with Axios, as the "Axios China" Newsletter by Bill Bishop of Sinocism. Look for a welcome e-mail next week from Axios. Going forward the format of the weekly newsletter will follow the pithy, concise Axios style. Second, the rates for the daily version of The Sinocism China Newsletter are increasing on November 18 from $11/month or $118/year to $15/month or $168/year. Anyone who has signed up under the loyal subscriber charter rate before November 18 will have the lower monthly or annual rates locked in at least through 2018, including annual renewals. You can subscribe here. To read the daily version, and, as the Sinocism tagline suggests, “get smarter about China” you can subscribe here. So far I am not hearing to expect any substantive breakthroughs with China on either trade or North Korea. China and the US will sign a lot of deals during the visit, but deals are easy for the Chinese and, once you wade through the PR spin, many of the signed "agreements" may actually be non-binding MOUs. I hope I am wrong but it sounds like the US President will shy away from any specific, hard asks around the metastasizing structural issues in the US-China economic relationship. But Xi Jinping will ensure Trump is well feted. The Forbidden City will close November 8 for Trump's private tour and Cui Tiankai, the soon-to-retire Chinese Ambassador to the US, told the media that the US President "will receive a "State visit-plus" featuring a military honor guard, official talks, formal banquet and "special arrangements". There has been some hope that on this trip the US might win freedom for Liu Xia, Liu Xiaobo's widow. In the meantime Prominent international writers have asked China to release her. Party rag The Global Times has praised Chief of Staff Kelly's recent comment to Fox News that China has ""a system of government that has apparently worked for the Chinese people." The PRC-South Korea "rapprochement" just before the Trump visit is noteworthy. This newsletter has suggested a few times over the last several weeks that Xi might find some sort of face-saving solution over THAAD to allow Beijing to back away from its hysterical reaction and rebuild ties with South Korea, with a goal towards driving a wedge between Seoul and Washington over North Korea. The story I heard was that the initial briefing to Xi about THAAD dramatically overstated its capabilities, leading Xi to overreact and then the entire system to overreact with him. Just days after the 19th Party Congress Xi seems to have gotten past the THAAD issue and made a smart correction of a mistaken policy that may reduce Trump’s multilateral DPRK options and leverage ahead of his Asia visit. For the past two decades, the post has been held by the first ranking member of the party’s secretariat, a role filled by a member of the Politburo Standing Committee. Chen Xi is a member of China’s second highest decision making body, the Politburo. Xi himself is a former head of the academy, as was his predecessor Hu Jintao and the recently retired ideology chief Liu Yunshan. Zhao Kezhi is the new head of the Ministry of Public Security and, as Sinocism predicted in the 10.25 newsletter, Xi loyalists Huang Kunming and Ding Xuexiang have been named Minister of Propaganda and head of the Central Committee General Office, respectively. The new head of the important Central Policy Research Office remains a mystery, as does the role that Hu Chunhua will take on. As expected as they always do these campaigns after Party Congresses. 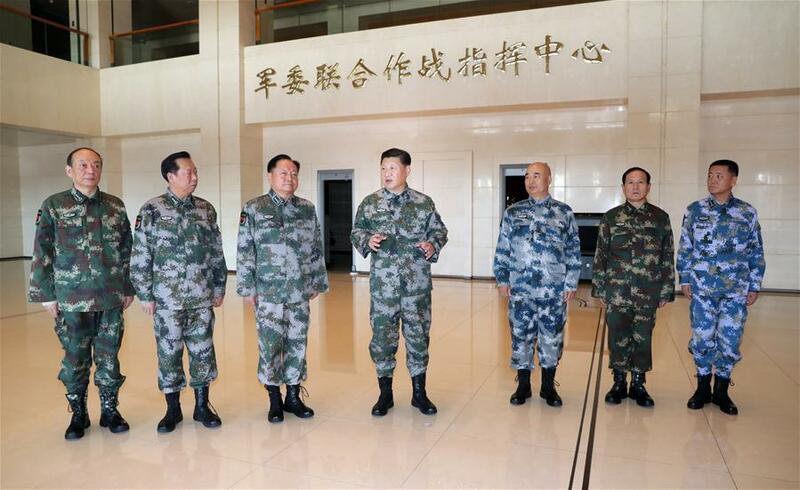 The intensity, the focus on one individual--Xi--and the inclusion of Chen Min'er on the "central publicity team" look a bit different than years past. Party members will spend a lot of time in the coming weeks on this. The campaign will be the prime political task for the Party and for the country, according to a decision of the CPC Central Committee released Thursday. The document summarized the essence of congress and made detailed requirements for Party members and organizations during the campaign. The Central Committee requires full training for Party members, as well as courses specifically for Party officials. Observers said the decision to include Chen Miner, Xi’s close associate and one of the youngest Politburo members, in the group pointed to his expanding role in the leadership. The Politburo trio will be part of a 36-member “central publicity team” that from Sunday will go to companies, villages, schools, communities and government departments to talk about the key points made in Xi’s 3½-hour speech at the Communist Party’s national congress last month, according to Xinhua. 5. 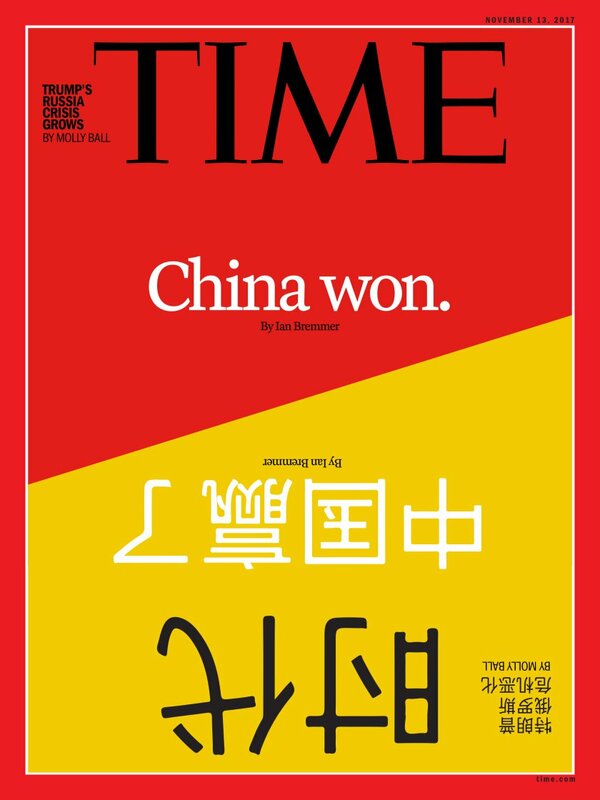 Time Magazine Asian Edition Cover Declares That "China Won"
7. The AI Race with China Is A New "Sputnik Moment"? The talent is there (e.g. software and deep learning). But just like in hardware design and hardware making processes where there are expensive mistakes, those people are extremely limited and they are mostly concentrated in the US. So it’s a question of whether you can hire these people to China or whether you can buy certain smaller companies with experience. 8. Does The Communist Party Hamper Basic Scientific Research? Or: Is it better to have the money and political will to spend on the research and then figure out how to work with and around the Party? Physicist Yangyang Cheng examines a proposed Chinese supercollider that, at 34 miles in circumference, would be double the size of the Large Hadron Collider (LHC). Western scientists are given to dismissing the party presence as a “formality” — but Chinese scientists know that when ideological loyalty and behavioral compliance directly factor into professional advancement and social mobility through “digital Leninism” aided by new technology, the party branch is never a figurehead, always the real boss. The context: The soon-to-retire central bank chief made the comments in a chapter in the recent released 19th Party Congress Study Guide 周小川：积极有序发展股权融资，稳步提高直接融资比重. They do not seem to differ from things said previously. The long mooted financial reforms now await political will and the perhaps the December Central Economic Work Conference. A decisive role for the market and supply side structural economic reforms were just written into the Party Constitution. Zhou Xiaochuan, Governor of People's Bank of China, said that the market should play a "decisive role" in allocating financial resources, but also stressed the importance of stronger regulation and Communist Party leadership in guiding financial reform, according to the Shanghai Securities News. Comment: It has been remarkable to watch the acrimony between critics and defenders of Guo Wengui. Some on each side are clearly not acting with pure motives though not every supporter or critic is simply a paid shill or spy for the other side. But accusing exiled lawyer Teng Biao of being a CCP spy calls into question all of Guo's other allegations. Guo should actually talk less, though that is tough for someone who so loves the spotlight. Teng Biao, a prominent citizen rights lawyer who is now living in the US, has been working since August to demonstrate fallacies in what Guo presents as evidence of corruption. In response, Guo and his followers accused Teng of being a spy for Beijing. Recently Teng wrote a long piece looking into Guo’s fans by quoting some of the analyses from Twitter..
“How could Guo Wengui attract so many brain-damaged fans on Twitter? The reason is ‘China has suffered from the regime of Zhao [CCP] for too long. '”...Resentment and hatred have accumulated for decades and now they find a warrior challenging the CCP, they project their wishful thinking onto Guo and become his followers. Guo is like an expert hypnotist, he creates strong suggestions leading people into a story plot. Serious Question: Did any PRC official bring up Guo Wengui with Mark Zuckerburg during his recent homage to Xi Jinping? “We did receive a report from a representative of the Chinese government about that account,” Stretch said. “We analyzed that report as we would any other, and took action based on our policies,” he said. But even as the Chinese government shook the cryptocurrency world, it signaled it will remain a key player in the unfolding story of digital money. China is exploring uses for the underlying technology known as blockchain, such as in logistics and contracts, as well as in its own digital currency. Xi Jinping personally signs off on every panda loan to a foreign country and, in a fine display of barbarian management, requires each head of state to personally request the pandas.